KARL Boyes has set his sights on becoming a Mosconi Cup legend. Boyes, 28, made his debut in PartyCasino.com Mosconi Cup but is desperate to show he is not a one-year wonder. "I'm the rookie in the team but if you have a look at the season I've had then I've had one of the best out of all the players," said Boyes, the current European number one who also won the World 8-Ball Championship in April. "But I don't want to be in the Mosconi Cup once and then not play in it again for five years. "I want to play in it year after year and establish myself in the side just like Shane Van Boening has done for the Americans. "Hopefully it will not be a case where I've only been in it once and then never again. "I'm looking forward to it, practising every day and even just thinking about it gets butterflies in my stomach. "It's special as it's live on Sky Sports and it's the only event we play that's live in England. It's also a chance for my friends and family to watch it and they don't normally get to see me as I'm playing over the world. "Darren Appleton played in it last year in Las Vegas and that spurred me on a lot to try to get in the European team this year - I was made up when I knew I was in the side. "Darren got in at the last minute as he won the US Open and we have played for England before so for us both to represent Europe in the Mosconi Cup will be brilliant." Boyes was a star of the English 8-ball scene before he started playing in the now-defunct IPT events in America. However, he made his name in 9-ball in 2007 when he was a surprise semi-finalist at the World Pool Championship at the Araneta Coliseum in Manila, Philippines. Since then he has only been denied a place in the Mosconi Cup due to the successes of his countrymen Daryl Peach, Mark Gray and Darren Appleton. But his top spot in the European rankings has seen him earn his place in this year's side and he admits it will be a dream come true to play in the Mosconi Cup. "Darren always dabbled in 9-ball pool and when I started playing at 19 or 20 I used to watch the Mosconi Cup and the World Pool Championship and wanted to give it a go," added Boyes. "I remember watching Jimmy White and Steve Davis play and as a kid I always watched Earl Strickland as he was always a bit wild. "Everyone that knows me thinks I will rise to the occasion and you never know how you will act but you hope you get a chance. If I hold myself together I will be alright. It won't bother me, no matter what happens as I've seen it all before. I wear my heart on my sleeve myself and when I'm playing I'm not like Ralf Souquet who is always composed. "I've been looking at clips on You Tube and keep watching Daryl call Earl Strickland 'scum of the earth' live on television (in the 2007 event) so it's very difficult to stay composed. "I've heard the atmosphere at the York Hall is awesome and electric but Johan (Ruijsink) is the best coach we could have as he is a very calming influence and into the mental side of the game. "He will be going to London prepared so we will not have to worry about anything. 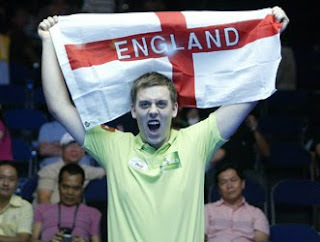 "There will be pressure but we (Great Britain) played in the World Team Championship in Germany and won it. All the best teams were there and we played the Philippines in the final, with the best players in the world, and the emotions were unbelievable but we still won." Boyes was part of the winning World Team Championship side and England were subsequently one of the favourites to win Matchroom Sport's World Cup of Pool in September. The two-man English team featured current 8-ball World Champion Boyes and former 9-ball World Champion Peach and was hotly tipped to do well. But they became one of the biggest underachievers of the competition as England only scraped past unfancied Qatar after a hill-hill clash then fell miserably out of the competition against an average French side. Boyes is keen to use that disappointment to spur him on to glory at the York Hall in Bethnal Green, east London from December 9 to 12. "The World Cup of Pool was a big event for me," admitted Boyes. "I'd just won a world title and had dominated on the Euro Tour. "The best events are the Matchroom ones and the fact we didn't do very well was a big disappointment which affected me for the next two months, although I did get to the last 16 in the China Open. "There are so many good English players in contention for the World Cup team with five or six in contention so there might be a two-year gap before you get picked again. "I was very down about the World Cup as I had wanted and expected to go much further in the event." "Last year Europe were billed as favourites in the Mosconi Cup but I don't think the team gelled. "This year me and Darren are both Englishmen playing in England and we like to have a laugh so I think there will be a good atmosphere. I think we will win, but it will be close."